It is with great pleasure that we present another installment of Ask Maggot. Mr. Maggot possesses a Ph.D in Interpersonal Communications and has been a guest on The Oprah Winfrey Show and a judge for StarSearch . When he is not busy terrorizing the prisoners in Commander Shades' Dismal Dungeon of Terror, he enjoys teaching origami and attempting to invent a way to kill people using only orange juice. He may currently be seen as Lord Scuffington in The Imaginary Invalid, now playing at the Leary Street Trough'n'Brew Dinner Theatre. Why does my boyfriend keep trying to start arguments with me? Ha! Maggot not fooled by your name - you not watch movies! If you watch movies, you know that true love always begin with argue, argue, argue and outright hate. People with peaceful love always get dumped for Julia Roberts or Jim Carrey. Boyfriend only trying to recapture magic of love's first bloom. But you have made Maggot speak of Julia Roberts. Come here so he can kill you now. garage door installation and service a DIY project? As Maggot explained to Fixit in stupid man's bedroom at 3AM, radio garage door not secure at all. Maggot not mean nothing by visit, only curious why Fixit thought Maggot wrote Home Depot column. Not to mention why Fixit call natural light "his". Maggot work for some real egomaniacs in his time, but they never claim to own sun. Well, that one guy did, but he replace Maggot with cheap robot. Was very sorry when discover built-in death ray was really only sparkler. But that all water under bridge now. Maggot digress. Maggot explain to Fixit that if Fixit can afford fancy new garage door, professional installation only enhance investment. Then Maggot cut off one of his legs and beat him with it. Good times! land, and I'll not be run off because of him, do you think you can help us? budget quicklime not good enough to conceal body odor, if you know what Maggot mean. It rare that letter actually gross Maggot out. Maggot salute you. Maggot have some experience with spocker caniels. It Maggot's considered opinion they eat feces to replace lost brain matter, because only thing dumber than sprocket daniels is one-legged guy who installs own garage door. But that just Maggot. My dachshund is losing small spots of hair on his rear hindquarters. Each day a new spot appears and he licks it until it scabs. The skin heals from the scabs and then turns black. It seems to be spreading. I have put antifungal medication on it, bathed him in medicated shampoo and used an antibiotic. Nothing seems to help. Rover or Snookums or Adolf pulling out jewelry before you can see. Not believe Maggot? Clear out living room for mosh pit and put on Laibach CD. This very big problem for small, nervous dog owners. Maggot blame society, and will be killing it soon. Good thing Maggot watch Dr. Phil today. Robot pal feeling unappreciated. Dr. Phil say it take two to tango. Maggot say it take two to beat with baseball bat, chop up corpse with circular saw and pack up in trash bag. But that not here or there. Ask self, what is root of passive-aggressive behavior? When was last time you resurrect robot buddy? Sent him tasty six-pack of D cell batteries? Let him go berserk in heart of city, slaughtering hundreds? No, you leave poor robot at spaceship while you gad about, correcting complex calculus equations, issuing ultimatums and getting killed. Maggot think you need to take long hard look at relationship, buddy. Decide what important to you. Then kill it. Sell them on eBay, including brother. Maggot surprised he have to tell you that. Maggot sick of young punk psycho killers. All have to have Shatner heads or hockey masks. Where creativity? Where individuality? Gone day where killer put flour sack on head and went to town. Gone day where sunglasses, fedora and leather gloves make scary killer. Possibilities endless! Bleach jugs, grocery sacks, refrigerator boxes, coffee cans, sheets of felt, cereal boxes, sofa cushions, toner cartridges, discarded newspaper, deluxe four-disc DVD version of Pearl Harbor, dead dogs, wastebaskets, manila envelopes, fried chicken buckets, metal tool boxes, cowboy hats three sizes too big, self-loading sprocket film projectors, Shannon Doherty - list go on! But if you determined to be lazy, Maggot still has face of garage door self-install man. Will sell it to you for cheap. 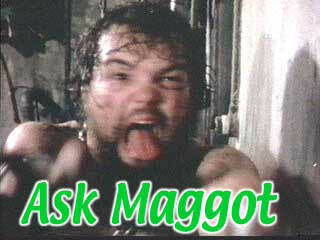 If you have an all-consuming question concerning the universe around you, and don't mind having your questions answered by a brutish fashion-challenged homicidal maniac, be sure to Ask Maggot! - reprinted from the out-of-print and fabulously rare issue #1 of B-MOVIES QUARTERLY magazine. Don't miss out! Order the latest issue NOW!